This is the second book in A Tree's Response trilogy. 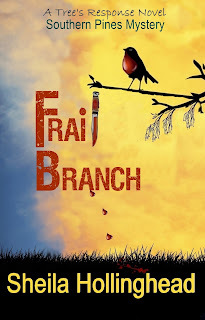 The first book, Frail Branch, is available for purchase on Kindle. 2. Where did the idea come from for the book? I don't remember about this particular book. This series has been rattling around in my brain while I worked on my In the Shadow of the Cedar books. There is an Agatha Christie book that has a similar killer, but not the same setting, story line, or other characters. That may have been the germ of the idea. In the case of the trilogy, A Tree's Response, of which this is part 2, I believe the story line came out of necessity. The thought process is something like--who will be murdered? If that person is the one murdered, why? Who would be the one most likely? It was (an overused word, but one that I think fits here) an organic process. 3. What genre does your book fall under? Cozy mystery although it is partly romance, partly Southern fiction, and maybe a few other things. A week after the murderer of Matthew Drake has been apprehended, a woman shows up at the estate, claiming to be Mildred Drake Denton, Matthew and Randall Drake's runaway sister. She carries a copy of Matthew Drake's will in hand, stating she is the sole heir. With her are her five young children, with strange names and stranger attitudes. Red Bud, Rose Petal, Mary Gold, and Wisteria May hold secrets that they do not themselves comprehend. The occupants of the house, including Zeke Hunter and Grace Phillips, are forced to vacate the premises. However, the next day Mildred is found dead, having tripped and fallen on the grounds near an abandoned well. Accidents do happen but the sheriff's department suspects murder. Mildred may have been killed by one of the people evicted from the estate. Or she may have stumbled onto one of Uncle Matthew's secrets. Or perhaps may have simply stumbled by her own clumsiness. Her children hold the answer to their mother's death, but they're not talking, except for Wisteria whose puzzling words may lead to her own demise. 5. How long did it take you to write the first draft of your manuscript? If things continue on track, a month, although I've been gathering information for several months now. 6. What other books would you compare this story to within your genre? 7. When will your book be published? 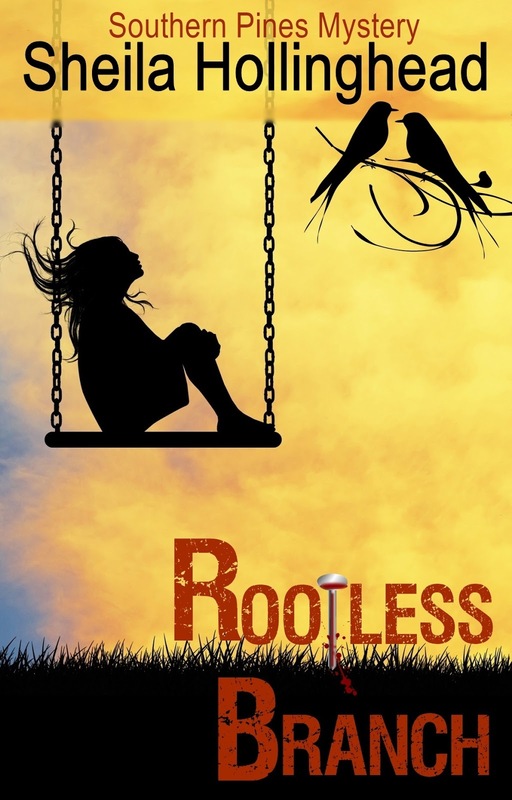 If all goes as planned, Rootless Branch will be published in February, 2016. The Thundersnow audio book has been in production for several months. Today is the day I submitted it for review! It takes ten to twelve days for approval and then it goes on sale. The Clothed in Thunder audio book is next up for production. Some of the responses on Twitter are hilarious. If I met Baby Hitler I'd just play him Adele's new song. His heart would melt. Everyone would be safe. Job done. Thanks Adele. First, I would shave off Baby Hitler's mustache. A more interesting question than killing baby Hitler - Would you have been possible to raise Hitler to become a decent person? That was the question on my mind when I began the Moonbow series. If Hitler had been raised differently, what would have been the outcome? Which is stronger--nature or nurture? However, along the way, my original question has faded away. The question I'm exploring now is whether parents who think their baby is Hitler's clone can forget the evil he committed in the past in order to love him as their own child. At this point of the story, it's unknown if the baby is Hitler. As a matter of fact, in Moonbow, DNA tests indicate that the child is not Hitler. Could you raise a clone of Hitler as your own child? Interesting question and not one easy to answer. 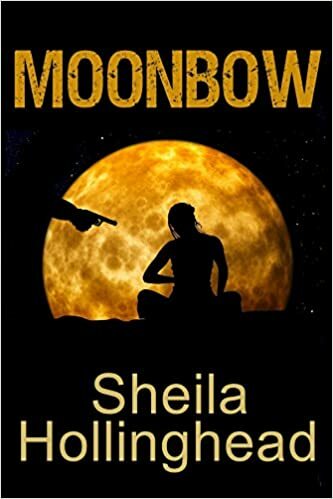 I plan to write the sequel to Moonbow soon. In the meantime, check it out on Amazon and see what you think! Someone asked me the other day about writer's block. Perhaps it's something I used to struggle with but not anymore. I've learned not to stress if I reach a point in the story and I'm unsure how to proceed. I've found if I relax, get away from the computer for a bit, my brain works through the solution. Even if it doesn't immediately, I can skip ahead to another scene, although I seldom do that now. I've mentioned before how I've worked out the best writing plan for me. 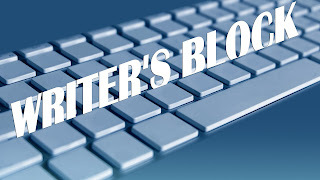 I write 20,000 words at a time--the beginning, the middle, and the end. I do not do a detailed outline but do know how I want each section to end and work toward that goal. I jot down scenes, as many as I can think of, before I begin writing. Until I get the beginning close to being coherent, I don't move on to the next part. This first draft is only for getting down the story. Later I go back to add more description or other details. I also keep a notebook for each book I write and gather quotes, ideas, characters, names, etc. as I go along. It's always been amazing how many ideas jump out at me from movies, books, articles, or even everyday life when I write. I often wonder if it's because I'm looking for them or being led to them. Either way works. And I have to mention music. Music is a big part of summoning the writing muse. I admit I'm a bit OCD about book titles. My OCDness manifests itself in this way: I like to keep the same word in the title of each book in a series. For example, In the Shadow of the Cedar series consists of four books, each with the word thunder in the title. I have written the first book of another series and moon will be in the title of each book. As a matter of fact, Moonbow is not only the name of the first book but also the name of the entire series. In my new series, Southern Pines Mysteries, I thought perhaps I would be content with using plant names or parts as titles. But my OCD self is not happy with that. Neither is my muse. In the past few days I've seen the word "branch" repeated several times in books I've read. Okay, I can take a hint--especially if it's my OCD self the muse is speaking to. I am writing a trilogy, A Tree's Response, within the series. 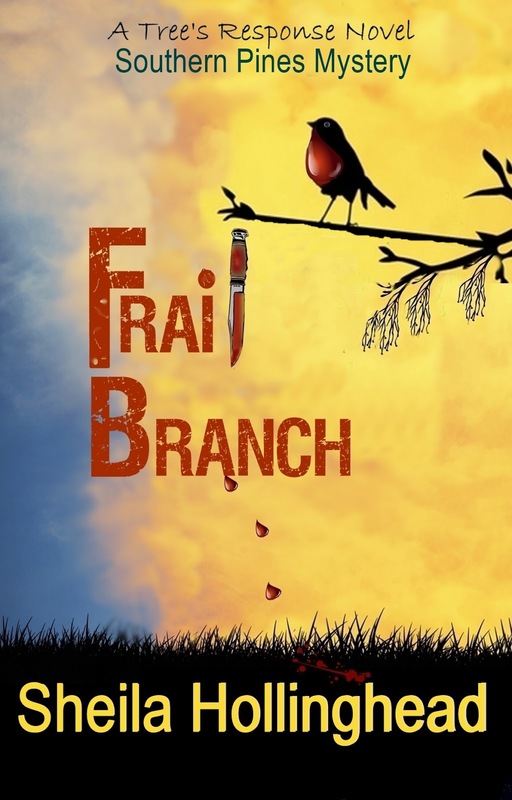 Frail Branch, published on October 10th, is the first book of the trilogy. The second book, previously Mysterious Wisteria, has been re-titled Rootless Branches. 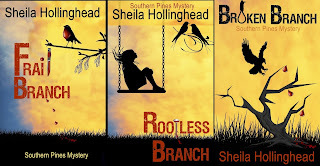 The third book, Twisted Roots, has now been re-titled Broken Branch. After the trilogy is finished, I'm not certain I'll continue with the branch theme although I've thought of more (or found more) such as Grafted Branch, Dead Branch, Root to Branch, Green Branch, Withering Branch, Blooming Branch, Flowering Branch, Doomed Branch, Burning Branch, and Budding Branch. Whew! That'll keep me busy if I write all those! 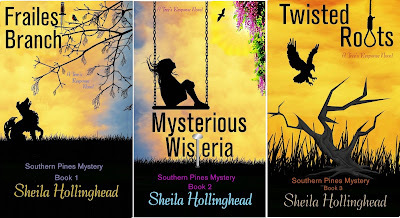 Here's my author page if you'd like to take a look at the thunder books: Sheila Hollinghead. Now if I could come up with future titles before publishing the first book of the series! 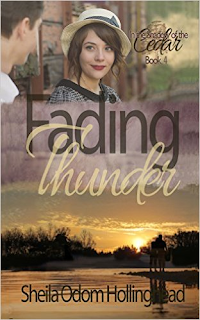 Fading Thunder, Kindle version, is free on Amazon this weekend. Grab a copy before the price increases. Sarah Jane Hutchinson dreams of her husband's return from World War II. His return is nothing like her dreams. A series of accidents and illnesses have left her weary and stressed. Michael Hutchinson returns in time to see the latest accident that leaves their son scarred for life. He blames Laurie, Sarah Jane's cousin, for the mishap. Furthermore, Michael does not return alone. A vicious military dog is with him, threatening the safety of Sarah Jane and their three-year-old son. And Marla Drake, Sarah Jane's best friend, hides secrets that not only threaten her own marriage to Dan but also cause accusations and heartache for Sarah Jane and Michael. Does everyone lie? Is there no one to be trusted? As the thunder slowly fades, Sarah Jane discovers the truth where it has always been ... in the shadow of the cedar.